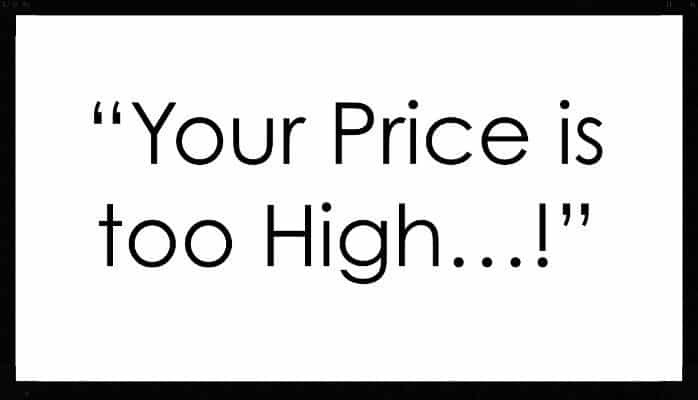 Lowering price, as a reaction to price objection, is the very worst way to improve business. It strips away profits and turns your business into a commodity. There is not a week goes by that I do not hear the painful problems of salespeople, sales managers and business owners dealing with price objections from customers. Time and time again the presentation is barely out of the salesperson’s mouth when the prospect asks the price and says it too expensive! The reality is, most of the time the price objection is a fallacy! Walk into any supermarket. Do you find floor-to-ceiling of discount brands? Sure there are discount stores but that is not where most of us shop! No, most of the products people are buying are brand name products that sell at a premium over generic or house brands. Coca-Cola, Lays, Starbucks, Shredded Wheat, Kraft the list goes on and on brand after brand and sector after sector. When given a choice between price and brand most people choose brand. Even bottled water, which is very comparable (H2O) people still do not buy the cheapest most of the time. Sure, there is always that brother-in-law who reads all the labels and whose cupboards are filled with off-brand canned goods. But, for most of us we want established brands. So, when we are all using iPhones and, if we can afford it, driving BMW then what is the deal with all of these price objections? How do you deal with price objections? Here is one route to take. First, find out how your pricing actually compares to the competition. A simple spreadsheet where you can compare the offerings and price should let you know if you are more expensive and why? The why is the important thing to know! Second, once you actually know where your product offers falls, compared to the competition. you can craft your presentation to support your price and head off the price objection. When you do get the price objections try to ask deeper, opened ended questions to get the prospect to share their feelings about your product. If they are buying the product elsewhere see if you can get a sense of your competitor’s value proposition. See what you can learn from what your competitor is doing. Real price objections do happen, however, if you want to win the sale you must learn the story behind the price objection and quickly build it into your presentation. Be certain that people do not really buy on price and so chances are with more information you can present your product with a higher value proposition. Price objections are an opportunity for salespeople to learn and become more advanced. Sales managers need to work with sales teams to share competitive information and coach on better approaches. Companies need to find the best sales performers (those successfully dealing with price objections) and share best practices with the salespeople that are struggling. Coaching is important and valuable. In most cases, a different approach that conveys the value of your offering will increase success. You may need to filter your leads better or creating a more effective sales process. The answer is there and it is rarely lower price.